Adjustable bar length is 18.5 inches. Heavy Duty and Long Lasting. Rust Resistance. Easy to setup/install. Easy to operate and handle. Quickly and efficiently opens cans. 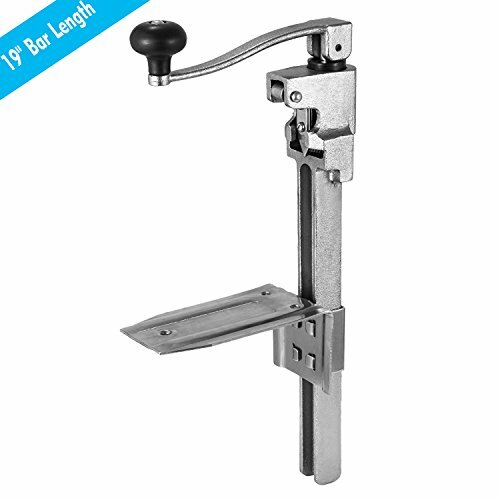 The bar and the clamp are made of nickel plated steel. A great solution for fast manual can opening and daily medium volume. Made for commercial use. Adjustable bar length is 18.5 inches. Heavy Duty and Long Lasting. Rust Resistance. Easy to setup/install. Easy to operate and handle. Quickly and efficiently opens cans. The bar and the clamp are made of nickel plated steel. A great solution for fast manual can opening and daily medium volume. Made of cast iron with durable body structure. Heavy duty construction.